2118 ⊙/ / Federal Republic of Germany - 1949 / 75, rich collection in the KABE illustrated album, with also all first issues used including Lower House of German Parliament 1949, 100 years stamps, Stephan, all sets helper of human resources, Bach seals, St. MaryÂ´s Church, Wuppertal set and so on. Furthermore also numerous se-tenants Heuss and so on. Very favorable! 2124 Federal Republic of Germany - 1949 / 69, clean mint never hinged collection, nearly complete in the lighthouse hingeless illustrated album with many better first issues. With also 20 Pfg. Lower House of German Parliament, 30 Pfg. 100 years stamps, Stephan, welfare 1949 / 55, 20 Pfg. Bach seals, Wuppertal series, transport exhibition, Heuss 1954 and so on. Michel approximate 2400,- €. 2126 /⊙ Federal Republic of Germany - nice collection from corners of the sheet the postal stamps in the lighthouse hingeless illustrated album with numerous different values, with also form numbers, up to issue sights formed. Additional as well various used values, with also nice S.O.T.N., as well a little Berlin including horizontal pairs. Interesting object! 2127 ⊙ Federal Republic of Germany - 1949 / 74, nice used collection, in the number of a major listing complete without Heuss fluorescent / watermark sideways in the lighthouse hingeless illustrated album with all first issues, including Lower House of German Parliament 1949, 100 years stamps, Stephan, all sets helper of human resources, Bach seals, St. MaryÂ´s Church and so on. A magnificent object! 2141 Federal Republic of Germany - 1949 / 89, clean mint never hinged collection in the lighthouse hingeless illustrated album. With also 30 Pfg. Welfare 1951, welfare 1953, further issues from the fifties, welfare and youth sets, special- and commemorative sets, complete years, Heuss fluorescent and watermark sideways and so on. Enormous catalog value! 2182 Federal Republic of Germany - 1994 / 2000, nice mint never hinged collection from different miniature sheet in two ring binder formed with numerous special- and commemorative issues, welfare and youth sets and so on, all in best quality, like in the subscription related. Already the post price amounts over 4500,- DM! 2194 Federal Republic of Germany - 1952 / 2000, nice mint never hinged collection in five green Lindner T hingeless printed form ring binder (hingeless form text from 1949 complete). Included are numerous mint never hinged issues, whereby the years 1965 / 2000 complete are present. Enormous catalog value, already the original price the beautiful albums amounts approximate 500,- €. 2221 Federal Republic of Germany - 1949 / 97, very nice mint never hinged collection, complete with all issued stamps in two lighthouse hingeless printed form albums. And, of course, Lower House of German Parliament 1949, 100 years stamps, all sets helper of human resources, Bach seals, posthorn set, St. MaryÂ´s Church, Wuppertal series, Heuss 1954, Heuss fluorescent and watermark sideways and so on. A very nice object! Michel approximate 7300,- €. 2236 /⊙ Federal Republic of Germany - 1952 / 54, very nice and high-value lot of only special- and welfare issues. As well enormously many corners of the sheet, blocks of four from the corner, upper margins and so on. Predominantly in mint never hinged condition. A more cultivated inventory, the be in the best way to the liquidation is suitable! Michel approximate 24000,- €. 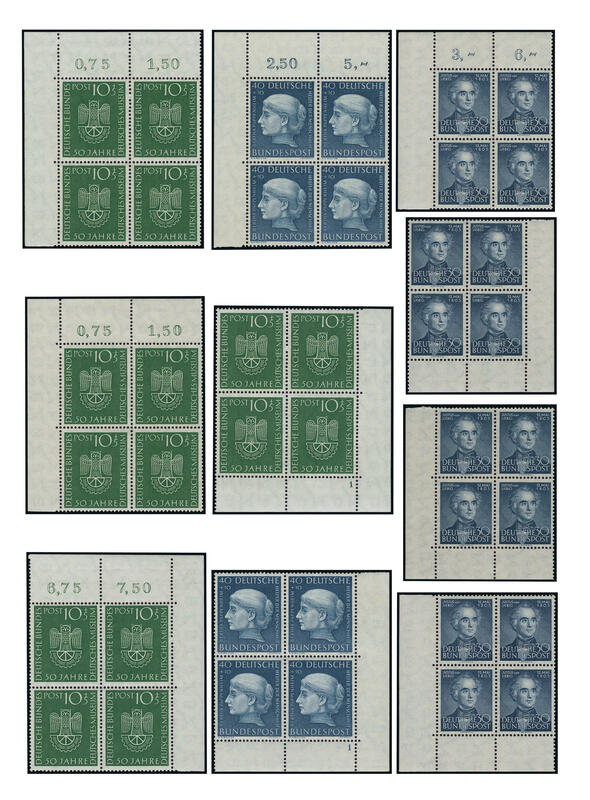 2239 Federal Republic of Germany - 1949 / 69, clean mint never hinged collection, in the number of a major listing except for posthorn set complete in the KABE hingeless illustrated album. With also Lower House of German Parliament 1949, 100 years stamps, all sets helper of human resources, St. MaryÂ´s Church, Wuppertal series, Heuss 1954, Heuss fluorescent, watermark sideways and so on. Favorable! 2241 ⊙ Federal Republic of Germany - Beethoven souvenir sheet stamps 1959, 100 complete sets, all perfect, mostly centric cancellation \"SONTHOFEN\". Already several sets with centric postmarks are heavy to find. This engros lot is suitable be outstanding to the Distribution on the internet, there those sets partly wide over catalogue value score. Very favorable! Michel for normal used sets 3750,- €. 2249 ⊙ Federal Republic of Germany - 1949 / 94, superb used collection, in the number of a major listing complete with all issued stamps, without Heuss fluorescent / watermark sideways. And, of course, the good issues of the early years like Lower House of German Parliament, 100 years stamps, all sets helper of human resources, Bach seals, St. MaryÂ´s Church and so on. Michel approximate 3200,- €. 2257 ✉ Federal Republic of Germany - interesting and extensive inventory from approximate 1200 covers, cards and postal stationery from the year 1949 packed in a carton. Many attractive documents, different frankings and use form, postage steps, single- and multiple franking and so on. Extensive treasure trove! 2288 ⊙/ Federal Republic of Germany / coil stamps - nice and extensive special collection the coil stamps in two ring binder formed with plenty of better issues. 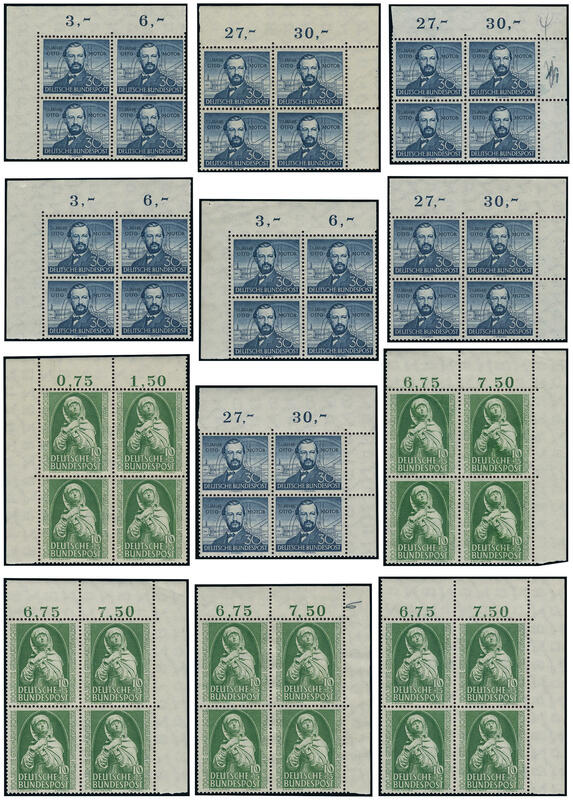 With also many end of a coil stamps roll including different-colored blank fields, different colours of the numbers as for instance also the scarce 40 Pfg. Prevention of accidents with blue number mint never hinged, numerous strip of five, straight and odd numbers and so on. Included are the issues Brandenburg Gate, prevention of accidents, castle and palace, as well sights. An extensive object with very high catalogue value! 2294 Federal Republic of Germany - nice mint never hinged special collection postal stamps in the Lindner ring binder. As well house order numbers, upper- and sub-edges, numerous horizontal pairs, corners of the sheet, coil stamps mint never hinged with counting numbers and so on. A magnificent object with very high catalogue value! 2296 /⊙ Federal Republic of Germany / coil stamp for vending machine - 1980 / 2002, extensive special collection the coil stamp for vending machine in the Lindner ring binder with numerous different issues, complete sets, mixed denomination value, types, numerous stamps with counting numbers and so on. Mint never hinged respectively clean, often centric cancellation interesting object! 2300 /⊙ Federal Republic of Germany - 1949 / 78, nice collection in two Lindner T ring binder formed parallel mint never hinged and neat cancelled, as well the mint never hinged collection except for the posthorn set complete including Heuss fluorescent and watermark sideways, as well all helper the humankind sets, St. MaryÂ´s Church and so on. Also the used collection is complete available including Heuss fluorescent and watermark sideways. A very nice object! Michel approximate 6000,- €. 2318 ⊙ Federal Republic of Germany - nice and extensive inventory of more than 1000 lovely corners of the sheet, almost all with beautiful centric postmarks from the seventies years up to the euro time in a large stockbook accommodated with numerous special- and commemorative issues, welfare and youth stamps and so on, very assorted. A delightful lot! 2319 ⊙ Federal Republic of Germany - 1982 / 2005, nice and rich collection in three hingeless printed form ring binder, nearly complete, almost everything with centric postmarks. As well enormously many corners of the sheet. A decorative object with enormous acquisition price! 2323 x Federal Republic of Germany - extensive inventory packed in a carton with a lot of material mounted on pages and stock cards. With also good issues of the early years including 70-90 Pfg. Posthorn unused, St. MaryÂ´s Church, helper the humankind sets, souvenir sheets and so on. Favorable treasure trove!